NETWORK UPDATE: With Cincinnati’s simulcast of MONDAY NIGHT FOOTBALL removed, both the SNL CHRISTMAS clip show and STATE OF AFFAIRS on NBC lost 0.1, leaving them at 1.4 and 1.0, respectively. (In the 10:30PM quarter-hour, AFFAIRS dipped to 0.9.) The rerun BIG BANG THEORY gained 0.1. The last MONDAY NIGHT FOOTBALL of the season dominated Monday cable at 5.12, up 1.3 from last week’s game. 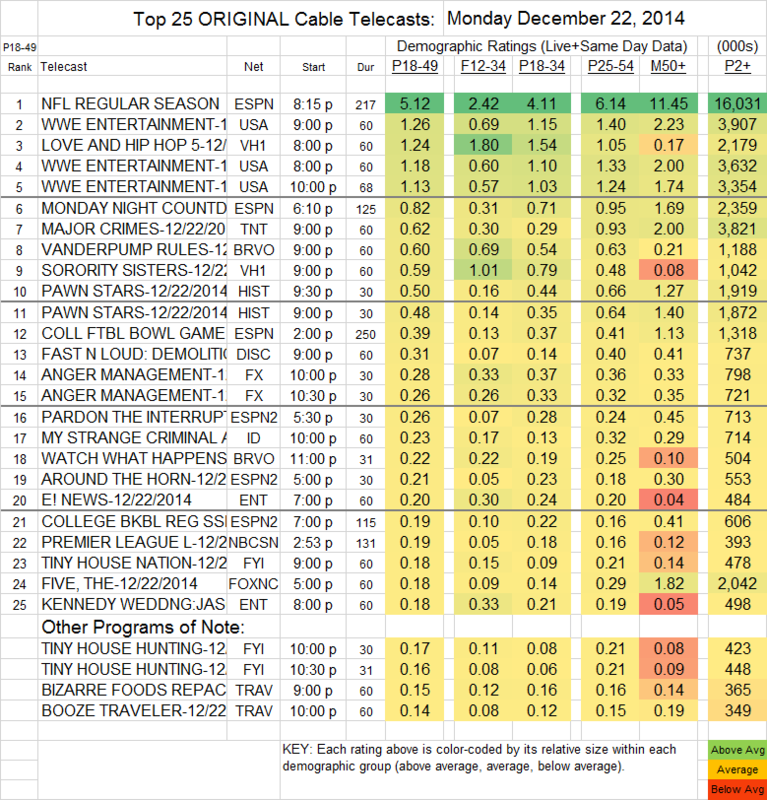 WWE (USA) was in the 1.26-1.13 range during its 3 hours, up a few hundredths. On VH1, LOVE & HIP-HOP HOLLYWOOD was down 0.12 to 1.24, and SORORITY SISTERS was also down 0.12 to 0.59. MAJOR CRIME (TNT) climbed 0.04 to 0.62. Bravo’s VANDERPUMP RULES lost 0.09 to 0.60. History’s PAWN STARS was at 0.50/0.48, down about half a tenth from last week. FAST N LOUD DEMOLITION (Discovery) was at 0.31. The final episodes of ANGER MANAGEMENT (FX) were at 0.28/0.26, compared to 0.27/0.22.